Aldous Huxley, 1894-1963. 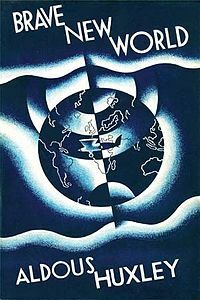 Brave New World, 1932. Chapter III. The 1st Earl’s marriage to the only daughter of the immensely wealthy Sir Solomon Bunbury, Bt, a Lord Mayor of London who, it was said, owned half the plantations in the West Indies, might well be described as ‘à la mode’, but thanks to the strength of character displayed by both parties the outcome was far removed from the dismal débâcle in which Hogarth’s characters were involved. The bride, whose mother had been a Miss ffossil of Norfolk, inherited not only the beauty which had made that lady the Queen of the Swaffham Assembly Rooms but much of the energy which her grandfather had so successfully displayed in the management of his estates. Of the grandeur of her husband’s position she was, from the first, fully appreciative and by her wit and by her social talents did much to enhance it. 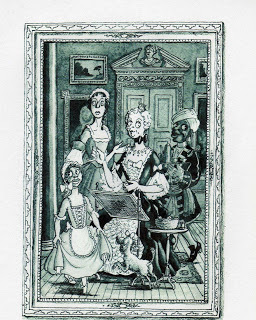 In Laroon’s delightful canvas she is shown in mourning for her husband, who had died the previous year, and accompanied by her two daughters, Letitia and Euphemia with, in the background, her devoted page, Hasdrubal, who had been born on her father’s estate in Jamaica. This engaging blackamoor was held in the highest esteem by the whole family and his mistress took a particular pleasure in his company and insisted on his being always about her person. The Lady Letitia never married but, on the tragic death of her elder brother, devoted herself to the upbringing of her little nephew the 3rd Earl. The Lady Euphemia, on the other hand, whose irrepressible gaiety and strangely exotic beauty attracted innumerable suitors, survived three husbands: the 3rd Marquess of Tumbledown, who died in his seventy-eighth year, shortly after their marriage; Prince Ludwig of Kilmansegg-Lauterbach who fell at the Battle of Minden; and lastly Lord Jonathan Firturse who was killed in the hunting-field. The Countess herself lived on to welcome her grandson’s first bride to Drayneflete and passed peacefully away at the faro table in 1772. The present Earl has always felt that the work of most of the great artists of the time represented in the Collection should be enjoyed by all lovers of art. He has therefore generously bequeathed this great collection to the National Portrait Gallery (in lieu of Death Duties). Moreover, in view of the present lack of space in the Gallery, he has commissioned Osbert Lancaster to prepare a fully illustrated volume which not only reproduces the works of art – from Holbein to Hockney – but also records the achievements and aristocratic personalities of the long line of Littlehampton. “Taken the key! Impossible!” cried Alicia. His cousin shook her head, and conducted them into a corridor where there were some family portraits. She showed them a tapestried chamber, the large figures upon the faded canvas looking threatening in the dusky light. “That fellow with the battle-ax looks as if he wanted to split George’s head open,” said Mr. Audley, pointing to a fierce warrior, whose uplifted arm appeared above George Talboys’ dark hair. There were lighted candles in the drawing-room. No new-fangled lamps had ever made their appearance at Audley Court. Sir Michael’s rooms were lighted by honest, thick, yellow-looking wax candles, in massive silver candlesticks, and in sconces against the walls. There was very little to see in the drawing-room; and George Talboys soon grew tired of staring at the handsome modern furniture, and at a few pictures of some of the Academicians. “Isn’t there a secret passage, or an old oak chest, or something of that kind, somewhere about the place, Alicia?” asked Robert. “Shall we try the secret passage, George?” asked Mr. Audley. Alicia led them into the room which had once been her nursery. It was now disused, except on very rare occasions when the house was full of company. Robert Audley lifted a corner of the carpet, according to his cousin’s directions, and disclosed a rudely-cut trap-door in the oak flooring. Robert obeyed her implicitly, and George submissively following his friend, found himself, in five minutes, standing amidst the elegant disorder of Lady Audley’s dressing-room. She had left the house in a hurry on her unlooked-for journey to London, and the whole of her glittering toilette apparatus lay about on the marble dressing-table. The atmosphere of the room was almost oppressive for the rich odors of perfumes in bottles whose gold stoppers had not been replaced. A bunch of hot-house flowers was withering upon a tiny writing-table. Two or three handsome dresses lay in a heap upon the ground, and the open doors of a wardrobe revealed the treasures within. Jewelry, ivory-backed hair-brushes, and exquisite china were scattered here and there about the apartment. George Talboys saw his bearded face and tall, gaunt figure reflected in the glass, and wondered to see how out of place he seemed among all these womanly luxuries. They went from the dressing-room to the boudoir, and through the boudoir into the ante-chamber, in which there were, as Alicia had said, about twenty valuable paintings, besides my lady’s portrait. My lady’s portrait stood on an easel, covered with a green baize in the center of the octagonal chamber. It had been a fancy of the artist to paint her standing in this very room, and to make his background a faithful reproduction of the pictured walls. I am afraid the young man belonged to the pre-Raphaelite brotherhood, for he had spent a most unconscionable time upon the accessories of this picture—upon my lady’s crispy ringlets and the heavy folds of her crimson velvet dress. The two young men looked at the paintings on the walls first, leaving this unfinished portrait for a bonne bouche. By this time it was dark, the candle carried by Robert only making one nucleus of light as he moved about holding it before the pictures one by one. The broad, bare window looked out upon the pale sky, tinged with the last cold flicker of the twilight. The ivy rustled against the glass with the same ominous shiver as that which agitated every leaf in the garden, prophetic of the storm that was to come. He paused with his hand on the baize, and solemnly addressed his friend. George fell back immediately. He took no more interest in any lady’s picture than in all the other wearinesses of this troublesome world. He fell back, and leaning his forehead against the window-panes, looked out at the night. When he turned round he saw that Robert had arranged the easel very conveniently, and that he had seated himself on a chair before it for the purpose of contemplating the painting at his leisure. He rose as George turned round. He took George’s place at the window, and George seated himself in the chair before the easel. Yes, the painter must have been a pre-Raphaelite. 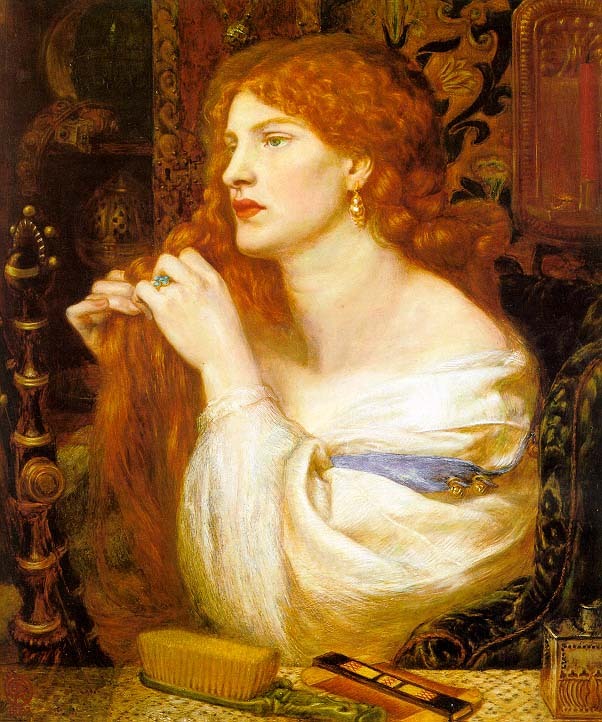 No one but a pre-Raphaelite would have painted, hair by hair, those feathery masses of ringlets, with every glimmer of gold, and every shadow of pale brown. No one but a pre-Raphaelite would have so exaggerated every attribute of that delicate face as to give a lurid brightness to the blonde complexion, and a strange, sinister light to the deep blue eyes. No one but a pre-Raphaelite could have given to that pretty pouting mouth the hard and almost wicked look it had in the portrait. It was so like, and yet so unlike. It was as if you had burned strange-colored fires before my lady’s face, and by their influence brought out new lines and new expressions never seen in it before. The perfection of feature, the brilliancy of coloring, were there; but I suppose the painter had copied quaint mediaeval monstrosities until his brain had grown bewildered, for my lady, in his portrait of her, had something of the aspect of a beautiful fiend. Her crimson dress, exaggerated like all the rest in this strange picture, hung about her in folds that looked like flames, her fair head peeping out of the lurid mass of color as if out of a raging furnace. Indeed the crimson dress, the sunshine on the face, the red gold gleaming in the yellow hair, the ripe scarlet of the pouting lips, the glowing colors of each accessory of the minutely painted background, all combined to render the first effect of the painting by no means an agreeable one. But strange as the picture was, it could not have made any great impression on George Talboys, for he sat before it for about a quarter of an hour without uttering a word—only staring blankly at the painted canvas, with the candlestick grasped in his strong right hand, and his left arm hanging loosely by his side. He sat so long in this attitude, that Robert turned round at last. Robert Audley took the candle from his friend’s hand, and crept back through the secret passage, followed by George—very quiet, but scarcely more quiet than usual. They found Alicia in the nursery waiting for them. Mary Elizabeth Braddon, 1835-1915. Lady Audley’s Secret, 1862. Chapter VIII. Before the Storm.